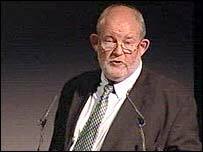 The Education Secretary, Charles Clarke, has stoked the argument about what universities are for - suggesting that study for its own sake is merely "an adornment to society". He questioned the point in having universities if they were not contributing to the UK's economy - and suggested that purely academic study should get only 1% of the funding it gets now. His remarks were not reported when he made them at University College Worcester a month ago but a garbled version surfaced in the Times Higher Education Supplement and some newspapers this Friday. In a statement in response, Mr Clarke denied being "in any way opposed to medieval studies (or for that matter Latin)". In January, the education secretary was accused of "pig ignorance and blind prejudice" after reportedly questioning the value of studying classics at university. His statement added: "I positively support the spread and development of both classical and medieval studies. "What I have said on a number of occasions, including at Worcester, is that the 'medieval concept' of the university as a community of scholars is only a very limited justification for the state to fund the apparatus of universities. "It is the wider social and economic role of universities which justifies more significant state financial support." University College Worcester has a transcript of its recording of his speech. This shows he quoted an unnamed university vice-chancellor's research papers arguing "that we should get back to a medieval concept of the university as a community of scholars unfettered by difficulties and problems of the wider society". Mr Clarke commented: "They don't in my opinion add up to an explanation or justification for how the state provides resources for universities in the modern world. "I have to ask myself as a guardian of these resources why the state should fund universities and what is the value of it." Later he said: "I argue that what I described as the medieval concept of a community of scholars seeking truth is not in itself a justification for the state to put money into that. "We might do it at say a level of a hundredth of what we do now, and have one university of medieval seekers after truth that we thought were very good, to support them as an adornment to our society, but I don't think that we will have the level of funding that we do now for universities unless we can justify it on some kind of basis of the type I have described." "If the analysis that I have discussed tonight is accepted - it may be not because there may be one or two medievalists in the room - the question is what does it mean to universities now?" Worcester's principal, Professor David Green, said Mr Clarke's message had been that the main reasons for supporting universities were to help people understand what was going on in society as well as making new discoveries. He had not criticised any subjects - not said, for instance, that the money should go to engineering and be withdrawn from media studies or English. An example Mr Clarke had given of useful work - with a wife who was the daughter of Estonian refugees - was that there should be more Baltic studies in the UK because we needed to understand the history of other societies if we were to do business with them. There had been no angry questions from the academics among his audience. "He left us with the impression that he was passionately committed to increasing public spending on universities," Prof Green said. The president of the Royal Historical Society, Jinty Nelson, King's College London professor of ancient and medieval history, said she thought all educated people accepted that higher study was a good thing in itself. "A civilised society is one which is better able to operate in the world we live in - a knowledge and understanding of the world which comes from a knowledge of the past is indispensable." The historical society's response to the government's white paper on the future of higher education complains about its excessively utilitarian approach. "At first I was astonished"